The year 1916 saw the launching of Germany's ruthless submarine campaign. Early in February, 70,000 German naval reservists had been brought to Kiel and Heligoland, to man the undersea boats that were expected to deal the death blow to Britain's Navy. The German edict went into effect February 29, 1916, placing armed merchant vessels in the same category with auxiliary cruisers and giving Germany an excuse for sending defenseless vessels to the bottom without warning. The first violation of Germany's pledge to America, that she would not sink without warning any unarmed merchant vessels, occurred on October 29, 1916, when the British steamship Marina, whose crew comprised several American sailors, was torpedoed without warning when off the coast of Scotland. Our government failed to call Germany to task for this outrage. Germany again showed disregard for her pledged word, and disdain for America's power, when her submarines on November 8, 1916, sank the American steamship Columbian off the coast of Spain. The crew, however, were permitted to take to boats before the ship was torpedoed. Four other unarmed merchant vessels were sunk without warning. They were the Fenay Bridge, the Englishman, and the Manchester Engineer. 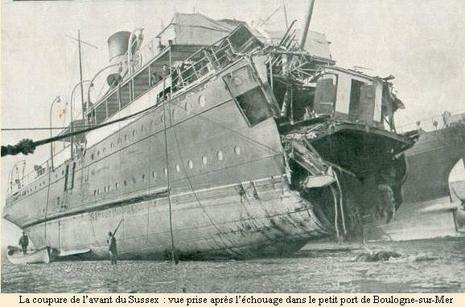 The lives of many Americans were imperiled when the channel steamer Sussex, plying between Folkestone and Dieppe, was hit by a torpedo on March 24, 1916, and some 50 of the 386 passengers aboard lost their lives. An explosion in the engine room followed the torpedo attack, causing panic aboard ship among the women and children. Two boats were overturned and a number of frightened women jumped into the sea. Some of the victims were killed outright by the impact of the torpedo. The vessel fortunately remained afloat and her wireless calls brought other ships to the rescue. Of the thirty Americans on board, five or six sustained painful injuries. The supreme naval tragedy of the year was the sinking of the French liner La Provence, by a torpedo in the Mediterranean Sea on February 26, 1916. She had sailed from Marseilles for Salonika with 3,500 soldiers and a crew of 500. Of these, 3,000 were drowned. A Turkish warship torpedoed the Russian Hospital Ship Portugal in the Black Sea on March 30, 1916, sending 101 wounded soldiers and 14 nuns to their death. A second Russian Hospital Ship, the Vperiode, was torpedoed in the Black Sea, July 9, 1916, with a loss of seven lives. The German submarine, U-53, appeared off Newport, R. I., October 7, 1916, and after the commander had landed and sent a message to Ambassador Bernstorff, the boat left the port. On the next day, when off Nantucket, this submersible raider sank five vessels—three British, one Dutch, and one Norwegian. On one of the British vessels, the Stephano, a passenger liner plying between New York and New Foundland, there were several Americans. Luckily the attack on these vessels had been observed by the commanders and crews of several nearby American destroyers, who rescued all the victims. The British liner Brussels, plying between England and Holland, was captured on June 23, 1916 by two German submarines and taken to Zeebrugge as a prize of war. The captain, Charles Fryatt, was identified as the commander of the British vessel that had attempted to ram a German submarine, when ordered to come to off Maas lightship on March 20, 1916. Although justified in so doing, Captain Fryatt was found guilty by a German courtmartial of a "crime against humanity" and put to death. Earl Kitchener, Minister for War in the British Cabinet, was drowned off the north coast of Scotland on the night of June 7, 1916, when the cruiser Hampshire, on which he was voyaging to Russia, struck a mine and sank. Four boats were lowered from the doomed ship, but all were swamped in the wild sea. Twenty minutes after striking the mine the Hampshire went down with 300 of the crew. On January 10, 1916, the English battleship King Edward VII was blown up by a mine, without loss of life. The British cruiser Arethusa also struck a mine off the coast of England, on February 14, 1916, and sank with 10 of her crew. The English battleship Russell was sunk in the Mediterranean on April 28, 1916, with the loss of 124 officers and men. 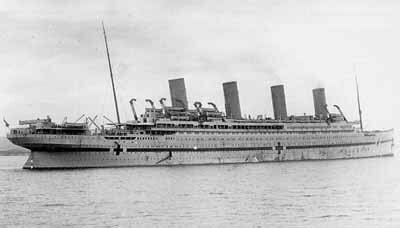 Laden with munitions the White Star liner Cymric was torpedoed and sunk, May 9, 1916, near the British coast with a loss of five killed. An Austrian transport was sent to the bottom in the Adriatic, May 10, 1916, by a French submarine. Four German steamers were sunk in the Baltic Sea by British and Russian submarines during May, 1916. On the night of May 30, 1916, an Italian destroyer, running into the harbor of Trieste, sank a large Austrian transport filled with soldiers, all of whom were drowned. The Italian transport, Prince Umberto, was sunk in the Adriatic on June 9, 1916, with a loss of 500 lives. In retaliation for the sinking of neutral Portuguese vessels, the Portuguese Government seized 38 German vessels lying at anchor in her harbors, and refused Germany's demand for their release.